In 2014, observations with NASA’s NuSTAR (Nuclear Spectroscopic Telescope Array) and Chandra X-ray Observatory showed that a few ULXs, which glow with X-ray light equal in luminosity to the total output at all wavelengths of millions of suns, are even less massive objects called neutron stars. These are the burnt-out cores of massive stars that exploded. Neutron stars typically contain only about 1.5 times the mass of the sun. Three such ULXs were identified as neutron stars in the last few years. Scientists discovered regular variations, or “pulsations,” in the X-ray emission from ULXs, behavior that is exhibited by neutron stars but not black holes. Now, researchers using data from NASA’s Chandra X-ray Observatory have identified a fourth ULX as being a neutron star, and found new clues about how these objects can shine so brightly. The newly characterized ULX is located in the Whirlpool galaxy, also known as M51. 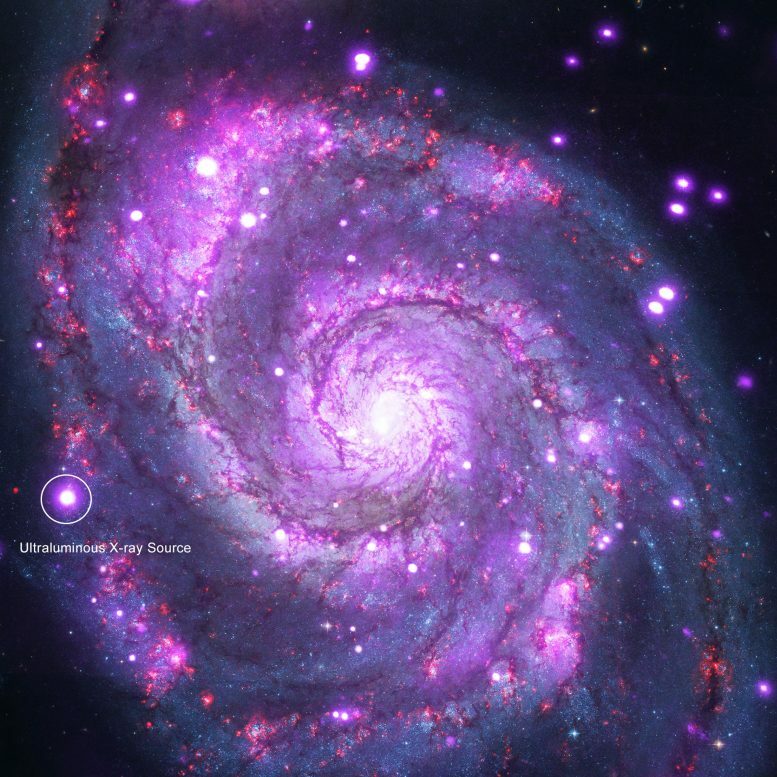 This composite image of the Whirlpool contains X-rays from Chandra (purple) and optical data from the Hubble Space Telescope (red, green, and blue). The ULX is marked with a circle. The scientists analyzed archival X-ray data taken by Chandra and discovered an unusual dip in the ULX’s X-ray spectrum, which is the intensity of X-rays measured at different wavelengths. After ruling out other possibilities, they concluded that the dip was likely from a process called cyclotron resonance scattering, which occurs when charged particles — either positively charged protons or negatively charged electrons — circle around in a magnetic field. The size of the dip in the X-ray spectrum, called a cyclotron line, implies magnetic field strengths that are at least 10,000 times greater than those associated with matter spiraling into a stellar-mass black hole, but are within the range observed for neutron stars. This provides strong evidence that this ULX is a neutron star rather than a black hole, and is the first such identification that did not involve the detection of X-ray pulsations. An accurate determination of the magnetic field strength depends on whether the cause of the cyclotron line, either protons or electrons, is known. If the line is from protons, then the magnetic fields around the neutron star are extremely strong, comparable to the strongest magnetic fields produced by neutron stars, and may in fact be helping to break the Eddington limit. Such strong magnetic fields could reduce the pressure from a ULX’s X-rays — the pressure that normally pushes away matter — allowing the neutron star to consume more matter than expected. The researchers currently don’t have a spectrum of the new ULX with enough detail to determine the cyclotron line’s origin. To further address this mystery, the researchers are planning to acquire more X-ray data on the ULX in M51 and look for cyclotron lines in other ULXs. A paper describing this research, led by Murray Brightman of the California Institute of Technology, appears in the latest issue of Nature Astronomy. The other authors include F. Fürst of the European Space Astronomy Centre; M.J. Middleton of University of Southampton, United Kingdom; D.J. Walton and A.C. Fabian of University of Cambridge, United Kingdom; D. Stern of NASA’s Jet Propulsion Laboratory; M. Heida of Caltech; D. Barret of France’s Centre national de la recherche scientifique and University of Toulouse; and M. Bachetti of Italy’s Istituto Nazionale di Astrofisica. 2 Comments on "Chandra X-Ray Observatory Reveals New Clues As To How ULXs Shine So Brightly"
In our model a primary star elaston contain enough energy that cascading down in the course of decomposition of elaston. The new star elastons have low energy. The created particles are forming low mass stars and partial matter outflows. In this picture a very massive star is not individual star but a tight nursery of the newly born young stars surrounding an elaston. With time a nursery is spreading, which has been confirmed by the observation that two-thirds of all main sequence stellar systems in the Galactic disk are composed of single stars.